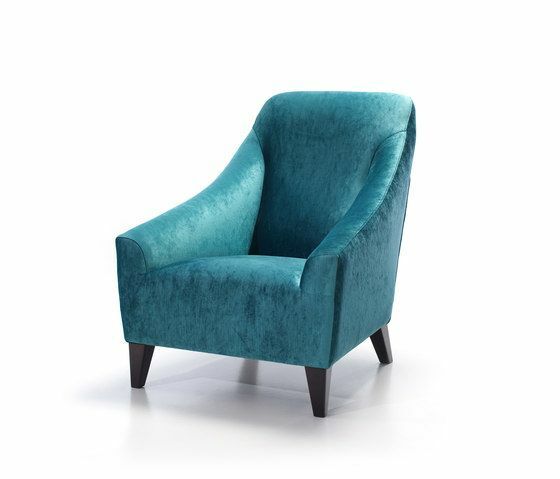 Contemporary style armchair, timeless and elegant shapes. A piece that can be placed in many environments: lounge, living room or bedroom. Its high backrest is perfect for a relaxing position. MATERIALS 1. Solid wood frame, covered with HR 30 kg/m3 foam. Suspension made with Nea elastic webbing, guarantee of quality 10 years. 2. Seat cushion in HR 35kg/m3 foam. Covered with thermo-sealed H250gr fibre. 3. Back in HR 30 kg/m3 foam. Covered with thermo-sealed H250gr fibre. 4. Legs in beech wood finished in multiple stained colours.